My son had a birthday party a few days ago and the theme was Outer Space. 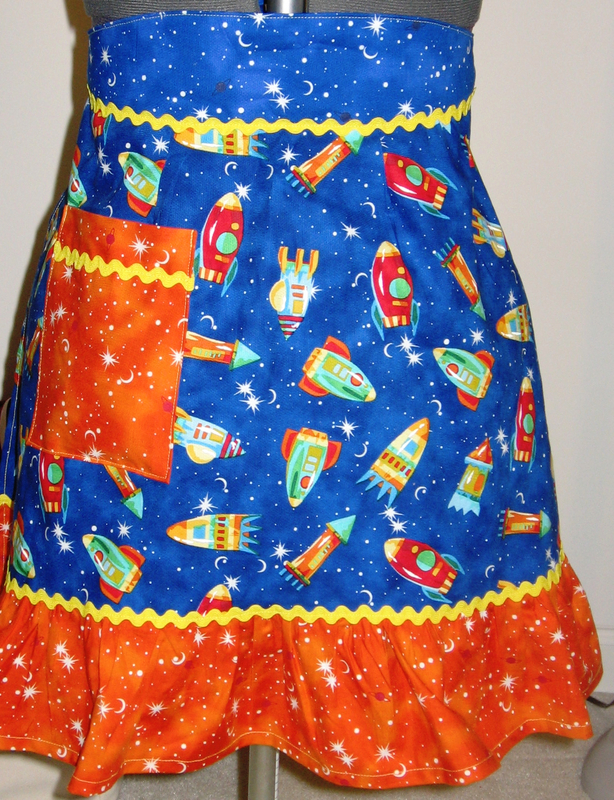 My plan was to make individual drawstring bags for each child with this cool spaceship fabric I found at JoAnn’s. Needless to say, I was running short of time and didn’t have a chance to sew a bag for each child. (I did manage to personalize ready-made canvas bags for them – which still were super cute). Instead, I used some of the fabric to make myself an apron to wear to the party. I love the colors, especially the orange ruffle and pocket. The pattern is by Cindy Taylor Oates from her “More Retro Aprons”. The yellow rick-rack turned out well – it was all I had to choose from in my stash. On another note, I was able to get a great dress form from my friend Laura. She had this in her attic for years and sold it to me for a great price. She is about my height, so this is a petite dress form. 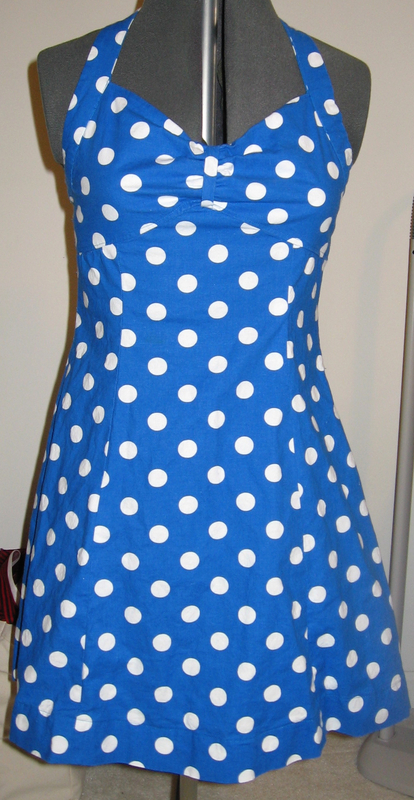 My polka sundress (which I finished last week) fits perfectly :). I’ve worn this a few time and people always ask me wear I got it. My standard reply is “this old thing? I made it myself.” They usually don’t believe me – one person swore she saw the same dress at target awhile back (then she asked me to make her one). I have the pattern and fabric for my next dress, so it should be finished in the next few weeks. I am working on my next free pattern, I know it’s been awhile – so please hang in there! This entry was posted in Aprons, Clothing, Sewing. Bookmark the permalink. You look beautiful in both of these! I’m glad you like them :)! I love that apron its so cool…I bet your son was proud of his mum! Thanks! I love your blog, I am going to add it to my list :).